The Barska Large Biomet ric Wall Safe model number AX12408 was designed by the Barska Company out of Southern California. Since 1994 Barska has combined quality and ground breaking technology to build strong brand recognition in the home security industry. The new Biosecure Technology puts security literally at your fingertips. What does this safe bring to the table? This Large Biometric Wall Safe is an all-new secure storage solution. It that has been designed to house important items such as medical supplies, personal valuables, or weapons. It features an industry leading biometric fingerprint scanner that is simple to program and capable of storing up to 120 fingerprints. This allows multiple users of your choosing to access the safe. This feature allows quick access to the safe’s contents as well as unparalleled security. Fingerprint locks are one of the more popular systems today. For those wanting ground breaking technology and top level security for their valuables. You have the ability to gain access to your possessions without locks or combinations. You no longer need to worry about misplacing keys or forgetting a combination. The unit changes everything you know about the safety and security of your belongings. While granting near instant access. You will never have to worry about someone gaining unauthorized access to your belongings again. You will have all of your security needs met. While still being easily accessible and easy to use. This Large Biometric Wall Safe also features a smaller interior locking compartment. For those needing an extra layer of security for more sensitive items. Additionally, all of Barska’s safes come with a back up set of keys. Unlike many other wall safes on the market, this model is equipped with a convenient interior LED light that allows ease of use and access. Even in the dark. You will never have to worry about finding what you need in case of an emergency. With a fold out tray and removable shelf, the safe is easy to organize and can be customized to fit all of your needs. The Large Biometric Wall Safe weighs in at 48 lbs. It comes with all the hardware needed for an easy, secure installation. The large flanges help with any mistakes you may make while installing the product. 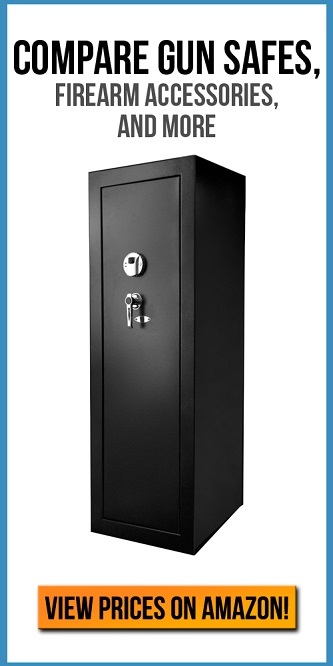 The safe also features solid steel design and motorized deadbolts for the highest level of security available on the market. Some people have stated that they find the product is lacking structural integrity in a few strategically weak spots. They recommend adding a few additional bolts to remedy this problem. Some people also worry on the size of the interior safe and its lack of padding due to the particular model they chose. If you’re looking for ground breaking technology and the most advanced security options available, this biometric safe is the perfect option for you. Allowing ease of use, easy installation and convenient features at a reasonable price. This Barska Large Biometric Wall Safe is exactly what you need for your home or office.